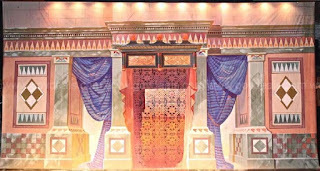 On Wednesday, the city of Winona, Minnesota opened an auction of the seventy-three canvas, theatrical backdrops originally created for the former Scottish Rite valley once located in the Winona Masonic Temple. They were created in 1909 for the Scottish Rite Valley in Winona, however the Valley relocated to Rochester in 1978. The lodge and other Masonic bodies have long since moved out, and the drops have remained almost entirely hidden away from view for almost forty years now. 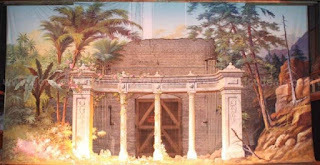 Today, the city has complete ownership of the temple and has at last decided to be rid of these priceless pieces of theatre art. These particular backdrops were specifically painted for the degrees of the Southern Jurisdiction of the AASR as they were staged at the turn of the last century. However, several of them can be easily used for presenting Blue Lodge and York Rite degrees, as well as other appendant bodies. The drops and their scenic accoutrements were used by the Winona Masons Lodge in traditional Scottish Rite ceremonies, in which novices would slowly learn the tenants [sic] of freemasonry through watching veterans perform theatrical rituals full of symbolism and hidden meanings. These drops helped the Masonic Temple in Winona earn a spot on the National Register of Historic Places, and they were hand-painted by the premier turn-of-the-century scenic painters, Sosman and Landis of Chicago. Death on horseback, a Moorish castle at night, the rebuilding of the Temple in Jerusalem, and an army of knights camped out before battle — these 73 drops depict a wide range of scenes that had deep symbolic meaning for Masons, and which were used in layered sets to create a three-dimensional effect. Some of them have hidden tricks. A seascape includes a little, moveable boat that can slowly sail across the horizon. In another scene, backstage hands can cause glowing lava to slowly pour down the slopes of a volcano. “It’s rare, and it’s very complete,” Masonic scenery expert Wendy Waszut-Barret said of the city’s full collection at a 2014 event — the last time the drops were shown. The drops have remained at the Masonic Temple since the were first used in the early 1900s, though they were rolled up for storage off-stage by preservation experts in 2014. Deterioration of the stage’s rigging system forced the drops to be taken down in 2014. Now, a 2018 project to replace the rigging system and renovate the theater into a more modern performance space is the impetus for the sale of most of the collection of drops. Out of the original collection of 99, the city is keeping 25 drops, one was damaged beyond repair, and the other 73 are now on-sale. For the next two weeks, the city will accept bids through GovDeals.com for this unique collection. The city of Winona and various governments across North America use this public auction website to sell off their surplus equipment, and buyers can find a wide range of things for sale on the site: school lunchroom tables, truck-mounted telescopic excavators, surplus stoplights, and a car-carrying ferry being sold by the Canadian province of Nova Scotia. As of Monday, there were two other items of fine art for sale on the site: an oil-painting by an unknown artist and a print of a John Singer Sargent painting. The bulk of GovDeals.com’s offerings are office equipment, computers, and old squad cars. The 73 drops and various other scenic pieces — mostly free-standing set pieces painted to look like trees or temple ruins — are currently being sold all-together as one lot. The sale ends on November 29, and buyers have 10 days to pick up the drops. The drops come “as is/where is.” Buyers are responsible for getting the large objects out of the building, and they must show proof of liability insurance that covers any damage to the building or injury during the removal process. 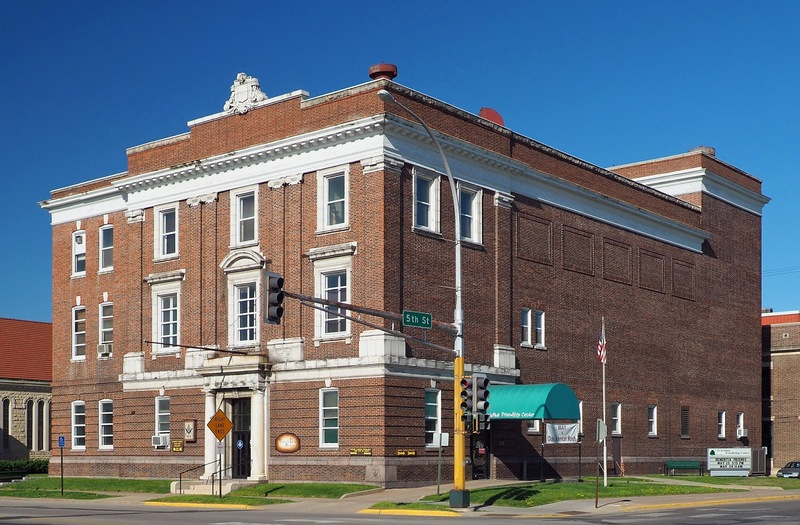 Prospective buyers may contact Winona Arts and Culture Coordinator Lee Gundersheimer at 507-457-8255 for an appointment to inspect the condition of the drops. There is currently a reserve price for this auction. If the reserve is not met, the city plans to hold another auction, selling the drops by individual scenes rather than one single lot. City officials want to get these drops out of the building before renovation work begins in early January. The City Council plans to use proceeds from this sale to help fund restoration work on the drops the city is keeping. Theatre drops are troublesome. They are huge, cumbersome, require special care to protect and use, and are not really art display pieces in the traditional sense. In reality, there are very few ways to reuse them once they have outlived their original installation and purpose. And the Scottish Rite valleys all across the country have created an awful lot of them over the years. As of 11:30AM on Friday, November 17th, 2017, the current high bid for the entire lot is just $1,030. It would be a crime for these to slip from the hands of the fraternity, which is the one organization that is able to actually use them for the purpose for which they were created. They are elaborate, beautiful, and are material treasures of Freemasonry that deserve to be seen and used. All 73 of them can be viewed individually on the auction site, but before you rush out and bid, be aware of the specifics of their complete removal, including deadlines. Read all of the stipulations very carefully. Does anyone know of a summer theatre, or amateur playhouse that could take them? Or of a large rink/exhibition hall that has large walls. 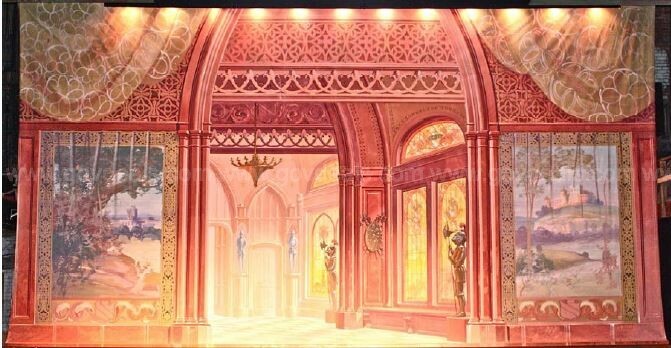 or a Masonic temple or Shrine with a big all purpose room. As Brother Chris stated these drops are truly single purpose pieces, not well suited for most theaters.They require special rigging and a loft above the stage, making for a ceiling height at least double the height of the drops to be useful. They also require a reinforced roof capable of supporting the weight of the drops and rigging. Very few non-professional theaters have the infrastructure to accommodate them. Also, as scenery these drops would work for only a very limited number of productions. It is unlikely a community theater would have the resources to handle these appropriately. The best option I can think of might be for an AASR Valley or Valleys to buy them and then resell the various drops and set pieces separately to Valleys as needed to replace the aging ones currently in use. 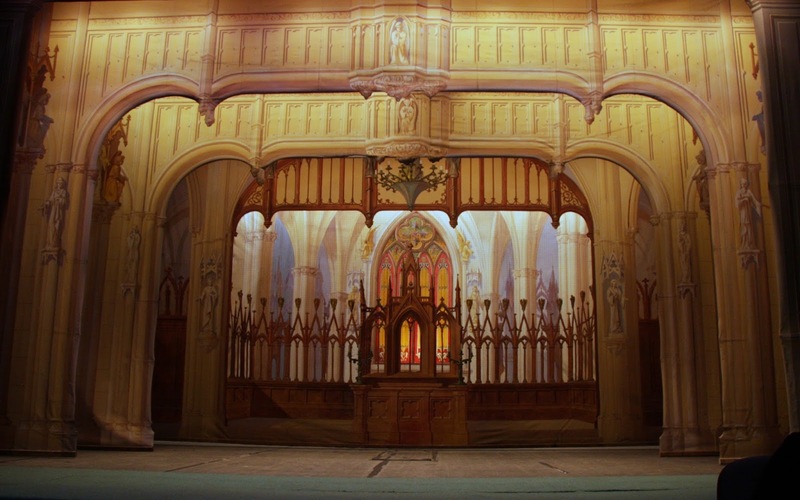 This is the lightest scenery available and most weigh less than 150 lbs., even with the wooden supports. 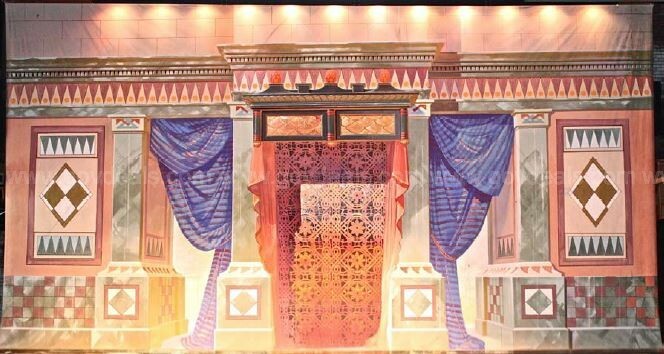 These backdrops were marketed to Masons as Masonic. 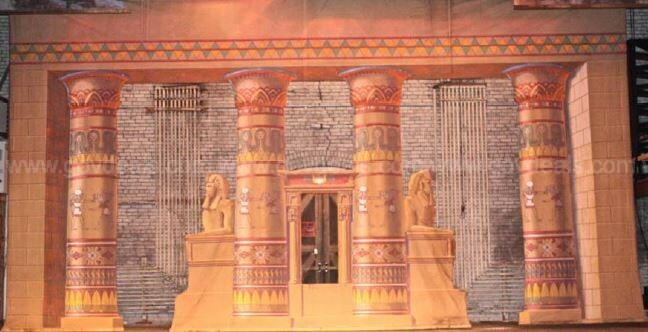 Other than for the 18th degree peristyle, the 30th degree JBM, the 32nd degree camp, and a few others, they were simple replicas of commercial theatre designs. It is the shared material culture between the Fraternity and general public that makes the scenery special. Most Scottish Rite theaters are literal time capsules as theatrical scenery was ephemeral and never intended to last for a century. My brothers I am aware of a Valley which is bidding on these drops and fully expects to purchase them for their use (to fill-in worn drops of their own or complete their collection). I have every reason to believe these will stay within the Fraternity. My Brothers I am aware that a brother from a SR Valley in the South is bidding on these drops and fully expects to be awarded the auction. The drops will then fill-in missing drops from that valley and others will be sold to other valleys as they may have need. It didn't work out for them, Terry. November 29 was a difficult day - not just for me, but also for theatre history and Masonic scholarship. It was a day when I hoped to celebrate a victory with a friend on his birthday. The Winona Scenery Collection went up for auction and sold for $10,010.00. 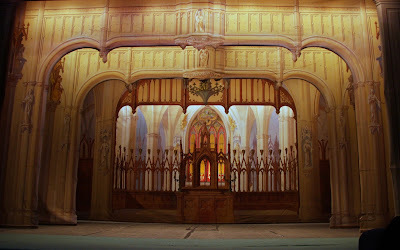 This was a miniscule fraction of the cost to replace the 73 pieces of this 1909 scenery collection by Sosman & Landis. The bid came in at only ten dollars more than I recommended that my client should spend. I could not advise him to spend any more, even though some of it was going to replace Scottish Rite scenery that had been destroyed years ago. There was too much water damage to justify spending more. I had gathered a coalition of personal representatives and SGIGs from various Scottish Rite Valleys to bid on the Winona scenery. Why? Each Valley could use a portion as it would match their existing collections beautifully and start a new one. It would also stay within the Fraternity. 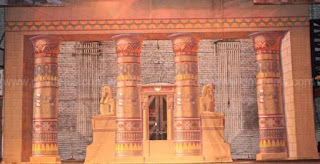 My only current hope is that the scenery as been sold to some other Scottish Rite theatre in need of replacements. You see every collection that I evaluate and take care of is like a child. I am their advocate. When the City of Winona decided to split up the collection I was devastated and compared it to keeping a teacup and abandoning the remainder of the Royal Doulton collection. 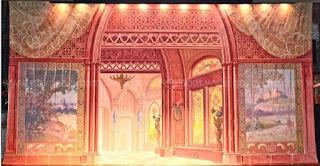 I did everything within my power to keep the scenery collection together, or at least ensure that portions of it found their way to a Masonic home. It is possible I failed and only time will tell where the backdrops end up. The collection was sold by the City of Winona with a representative who never understood what they were losing. Even as I looked the auction description, all of the specifications were wrong. The city sited that the scenery tubes were 36’ long. No, they were 20’ long. The city explained to prospective buyers that the tubes were 2-3’ in diameter. No, they were two or three drops wrapped on 6” rolls. Incompetence? No. Simple apathy. It was a lack of caring for these artifacts that sealed their fate, not ever understanding that they represented a shared cultural heritage between the Fraternity and American Public. It is a loss of epic proportions. I can say no more.